The iOS version of PDFpen lets you manage and edit PDF documents on your iPad, including adding and editing text, adding and resizing images, and filling in forms. You can also add comments, annotations, shapes, and freehand marks, and you can even include standard proofreading symbols from the PDFpen’s extensive library. The app lets you import images from the iPad's Photos library, and you can save frequently used images—such as your signature—for easy access. A thumbnail-view sidebar gives you an overview of a document's contents, and you can duplicate documents, combine documents, and delete pages from documents. The company also announced that both PDFpen for iPad and the latest versions of PDFpen and PDFpenPro for Mac can store documents in iCloud, letting you easily access and edit your PDF documents from multiple devices. The iPad version can also open files from and save files to Dropbox, Google Docs, and Evernote; you can also transfer files to and from your iPad via iTunes, FTP, WebDAV, and iDisk. PDFpen for iPad requires iOS 5 and is currently available from the App Store for an introductory price of $10. The latest updates to PDFpen and PDFpenPro for Mac, version 5.7 for both, are free. However, if you purchased either Mac app directly from Smile, you'll need to purchase the $1 PDFpen Cloud Access app for iCloud syncing. (The latest Mac App Store versions of PDFpen and PDFpenPro include the Cloud Access component.) 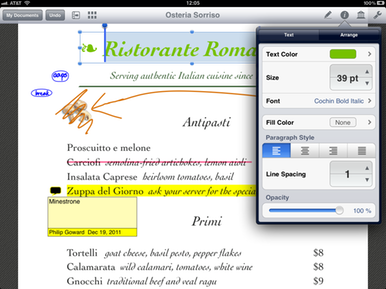 New purchases of PDFpen for Mac are $60; PDFpenPro is $100. Smile will be showing off its wares at Booth No. 228 at this week’s Macworld | iWorld show in San Francisco's Moscone West exhibit hall.